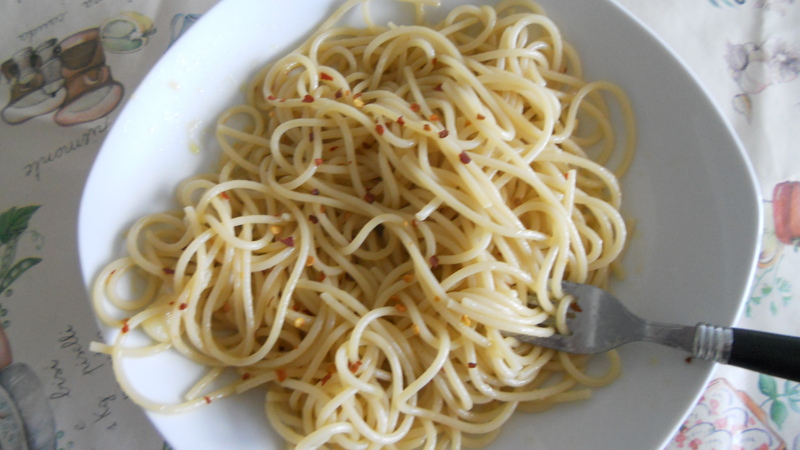 Translated it is simply spaghetti with garlic and oil and while that may sound boring it is actually quite delicious. And if you don’t eat too much it’s a pretty healthy meal as well. The ingredients needed for this recipe are basic staples you should keep in your kitchen since you’ll use them in countless other recipes. Plus this is honestly one of the cheapest meals you’ll eat all semester so you can feel good about that too. So if you want to spice up your life tonight, have some good old pasta the Italian way. Cook pasta in boiling, salted water until al dente. A few minutes before the pasta is done heat the olive oil in a saucepan over medium heat. Add the garlic and red pepper flakes and cook until the garlic is lightly browned. Drain the pasta and transfer to the saucepan tossing to coat. Add a little extra oil if it seems dry. Sprinkle with a dash of salt and serve immediately.